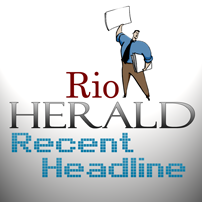 We deeply regret to inform our loyal and longtime readers that the Rio Grande Herald has ceased publication. The last issue of the Herald was published on Thursday, April 29. The decision to cease publication was made by management based in McAllen, Texas. The entire business will be closed effective May 30, 2010. Anyone wishing to pick up pictures and other documents should do so within the next week or so. The Rio Grande Herald staff is very thankful and appreciative to the many outstanding citizens and businesses of Starr County that have worked with us over may years. We have been honored to serve Starr County and try in some small way to contribute to its betterment and growth. Herald Managing Editor Kenneth Roberts emphasized, "I have been honored to work in this capacity for more than 26 1/2 years. I have experienced tremendous growth both on a personal and professional level. I have formed many lifelong friendships that I will always cherish. I know that my statements are shared by the other Herald staff members. We all wish the best for Starr County in the coming years." I have worked for the Rio Grande Herald since 2002 and like Mr. Roberts, I feel I owe it to Starr County to keep contributing to our growth in any way possible that is within my reach. It is with this goal in mind that I have decided to keep this website active, updating it regularly with as much useful information pertaining to Starr County as I am able to.